To wrap up the Humanity series, which began with discussions on The Original Commission of God and then on The Global People of God, we are going to end on a more directly practical note. Taking what we have realized about humanity so far, we are going to discuss one major way that we live out our humanity, and it is something that actually isn’t thought about too much. How we use our possessions. And what makes this issue so important is that “The things we own and use … lie close to the bone of our individual and collective sense of identity.” The very fact that we have possessions reveals a lot about what it means to be human. It’s not just a matter of our possessions being mere externalities in relation to us, and that what we do with them doesn’t have much to do with our own hearts and the condition of our souls – no, they have a lot to do with who we are, and what we are. In a deep discussion of the relationship between being and having, Johnson makes a good point. That to be alive today is to own something, no matter how poor you are – “the claim to ‘have’ and therefore to ‘be’ extends beyond our bodies and our material possessions to every possible sort of ‘ownership,’ of ideas, plans, time, space, ideals, friends, partners, spouses, virtues.” It’s not just about material things. The Bible is absolutely saturated with texts that deal with possessions. However, scholars are in agreement that a coherent system of what a Christian should do with possessions simply can’t be drawn from the Bible. For example, we have commandments for total renunciation of possessions alongside commandments of almsgiving and hospitality. But, the more I’ve thought about this, the more I see it as utterly appropriate that Scripture is ambiguous on this issue. It points beyond itself to the larger issues – this discussion is about stuff, but this isn’t just about stuff. So I’ve had to fight the tendency to try to take into account all of the biblical evidence. What I would rather focus on are some of the larger issues connected to the whole idea of possessions, like the ones just mentioned, presupposing the vast importance the Bible attaches to possessions. Possessions are so important because they both represent and effect our response to reality. They are a crucial part of our body language. What do you think of as real, and important? Look at your body language, what you do with your possessions. 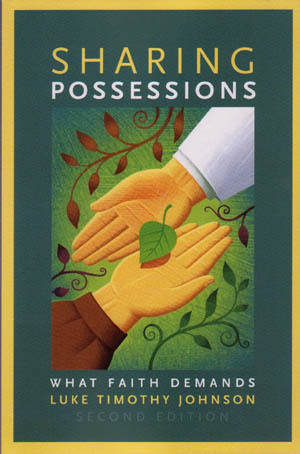 You will use your possessions to respond to what your heart holds in a prominent place. “For where your treasure is, there will your heart be also.” You can flip this around. “Where your heart is, there your treasure will be also. The question always before us is are we going to respond in any given situation in such a way that says God is what is most real to us–or anything else? What is wrong with humanity is that it has turned away from God and served other things. The paradigmatic Jewish and Gentile sins are idolatry. The world has chosen to worship other things, images, rather than the God of Israel who has no image. Except for us, those created in his image and meant to bear his image. To turn from the imageless God to serve that which can be seen and may offer more immediate satisfaction, those things that are ours, is to fall from being properly human. Not just properly Christian, not as if you’ve just had a religious failing–but falling short of the ideal human. “The things of the world are the raw material for the fashioning of my idol,” Johnson says. Just as Israel took their gold to make their golden calf, you have possessions, and most of them must be used at some point. Will they be used to fashion an idol? Or will they be used in such a way that their ultimate owner would approve of? We are really stewards, caretakers, there is nothing we have total ownership of. Though Scripture doesn’t offer clear cut guidelines for how to do so, it is absolutely clear that possessions are properly dealt with, which means God is properly served and humanity does what it is meant to do, is when possessions are shared. Why? Because it’s about sharing as the humanity that we are intended to be. By the original commission of God, we are called to serve him by doing the things that we are meant to do, working, serving, protecting, creating, and all in community. One big point about all of this is that by serving others you are serving God. And the question of how exactly you live this out shows how necessarily ambiguous it is. Of how much time you should spend in service to others and how much time you need for yourself. How much money you should keep and give away. How much of your daily energy should be spent for the sake of those around you instead of yourself. Your situation is different from others. There are cultural differences, social differences. Scripture has done us a service in avoiding mapping out for us exactly what we should do with possessions.Because what we are supposed to do is live in an “imaginative obedience,” that is, actually putting in the work of being in conversation with God, our own hearts, with our neighbors, to see how we can best serve God and neighbor and world through our actions with what we have and who we are. And at the end of the day, we are to be pleased with what we have, as Hebrews 13:5 makes explicit. I’m not sure faith can stand when someone can truly question God’s provision. As we saw in the first week, Jesus best fulfills the Original Commission of God. Jesus is the ultimate ruler, ultimate priest, ultimate creator, ultimate HUMAN. He is the ultimate sharer. Jesus is so important because he was exactly what Israel needed, and because he is exactly what humanity needs. Humanity needs God to share himself with us. It is the only way we have life, it’s the only way we have our being, the only way we can have any sort of meaning or enjoyment or happiness or joy. Jesus’ death on the cross is the ultimate paradigm of what it means to share. Just as God had instated a sacrificial system by which his people would give to him, Jesus ends up being the ultimate sacrifice, the ultimate gift. By sharing his very life, God through Jesus accomplishes the ultimate sharing act. A series on humanity must therefore end on a note of worship. 2 Cor 9:7 – “Each of you must give as you have made up your mind, not reluctantly or under compulsion, for God loves a cheerful giver.” Paul is talking about one giving to another, but for a long time I’ve loved to apply this to the idea of worship. The only thing that we can truly give God that he cannot take from us, is worship. God loves a cheerful giver, that is, a genuine giver. It’s why the God who instated a policy of sacrifices for his people says in Jeremiah (6:20) your sacrifices aren’t pleasing to me; In Isaiah (1:11) I’m not delighted by sacrifices, In Malachi (1:10) you might as well shut the temple doors for all I care, because for this God, as 1 Samuel (15:22) and Hosea (6:6) attest, desires steadfast love, not sacrifice. How you use possessions, all of those things entrusted to your care, and are at your disposal, is so central to being human. Bearers of the image of God, a community of rulers and priests. It is central to your living, your loving, your serving, and ultimately, your worshiping.